1. In a food processor, place the breadcrumbs with the eggs, garlic, peas, basil and both cheeses, then pulse to a coarse paste. Spoon this mixture into a bowl, add the lemon zest and season well. 2. Arrange the courgette strips into 8 star shapes on a board. Place a spoonful of the cheese mixture in the centre of each and fold the courgettes over the top to form a parcel. Refrigerate the patties for at least 30 minutes, preferably longer if you have time. 3. Preheat the griddle or light the barbecue to medium heat, and heat a frying pan, if you wish. Brush each pattie with a little oil and place on the griddle or frying pan on the barbecue. Cook for 4-5 minutes on each side, turning gently once, flattening a little after each turn, or until char-marked and cooked in the middle. As they cook they will soften. 4. 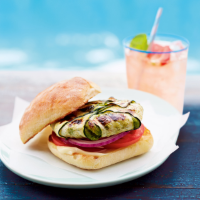 Serve the burgers in toasted soft buns with tomato slices, fresh mayonnaise and a little sliced red onion.